I can't believe it's been two and a half months since I've blogged about the garden. Time sure flies when life is pulling you in a million different directions (more on that later). This past winter didn't help either. For the longest time, it felt as if spring would never arrive. Looking outside and seeing nothing but snow for two solid months was enough to make me question seriously why we live here. Cleaning two months worth of dog crap didn't help either. But then small patches of earth begin to reappear, the tree buds start to swell, and somehow your mindset changes. It's like that every year here. But this past winter was particularly brutal. I'm just glad now that the garden is slowly coming back to life again. In any case, I'm happy to report that things are moving along on the spring gardening front, even if I am a bit behind schedule. But strangely, I think I'm OK with that. One of my goals this year is to take a more relaxed approach to gardening. There are a millions things on my to-do list. And eventually they will all get done. But I'm looking forward to other activities this summer as well. Anyway, here is a brief run down of things I've been working on in no particular order. My raised beds are still pretty empty, but I do have some spring greens planted. This year, I'm putting greater effort into grow more lettuce. This is the first of three sowings. I've dressed all of my beds with compost, including these two, which contain my june-bearing and ever-bearing strawberries. Soon, I will mulch these with straw as well. I'm hoping for a nice harvest this year. This year, I've added seven more fruit trees to our growing home orchard. All of my tall-spindle apple trees survived the winter even though a fair number of limbs were lost. (I did lose one tree last summer. Interestingly, it was the only tree I did not purchase online, but instead at a local Home Depot. Go figure.) I planted 4 more apple trees to this row this past weekend. Who knows, maybe we'll even get a couple apples this fall. I ordered this year's trees from Cummins nursery. They were beautiful trees and arrived in great condition. The circle bed is slowly coming back to life. I'll wait a couple more weeks to assess this space and fill in any empty spots with new perennials I started earlier this year. The west garden is slowly taking shape. I never got around to blogging about it last fall, but I did manage to install a long growing bed to the left of these four tall-raised beds and lined the paths with weed barrier. Eventually, the paths will be filled with pea gravel. My Fava beans are coming along nicely. Because of the prolonged winter, I decided to start these indoors this year. This past weekend, I also built a permanent trellis for my blackberry vines. Prior to this, the vines were attached to string stretched across simple 4 ft stakes. Needless to say, the stakes didn't stand a chance this past winter and all of the vines laid flat on the ground. Thankfully, there was not much damage to the vines themselves and they are now regrowing nicely. And here are the rest. It's always a challenge tending to all of these young plants this time of year. Hopefully I'll be able to plant out most of these during the next month. Finally, I've waited a year to see this drumstick primula bloom. I'd started it from seed last spring. Well worth it in my opinion. It is nice to see you blogging again. And yes your primula is so worth it. I'm putting in a perennial bed (much smaller than yours) and I didn't even think of primulas. I'm trying to keep myself in lettuce too. I always fail though. When I glean on the farms they have the most beautiful lettuce even in August. Why can't I do that? I figure if I'm persistent enough eventually it will work. I've missed your posts! The primula is gorgeous & your garden is looking great - no surprise there! You may be behind but it looks like you are much further along than I am - I'm definitely having space issues under the lights right now. I know what you mean about being pulled in so many different directions - I have often felt (especially lately) that I'm doing a bit of this and bit of that but having a hard time actually completing things for that very reason. Wonderful post. You have so much going on. Love all the lettuce! You'll have a lot of nice greens this year! Winter seemed so long and cold. It's nice to see your gardens and so much green growth beginning. I too feel so far behind this year. 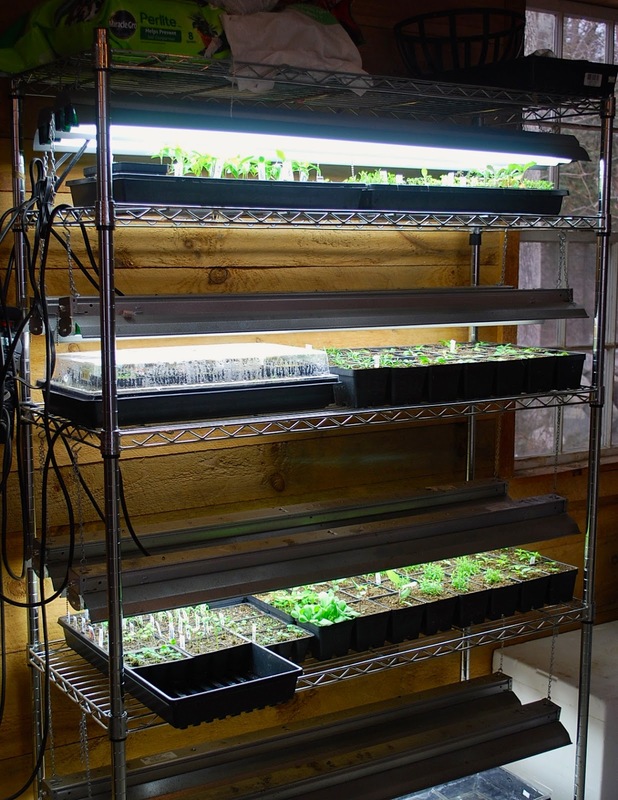 Your lettuce and spring greens are beautifully arranged and spaced! It is great to see your blog again. The drumstick primula is so cute! Have never heard of it before. Thomas, just got caught up on your blog. Oh you have had some wonderful months, and now yes, finally, we are leaping ahead. Here in Nova Scotia, it seems like everything came on and bloomed at once. I don't recall that ever before. I am behind in planting out though, but hopefully this weekend all will be in. 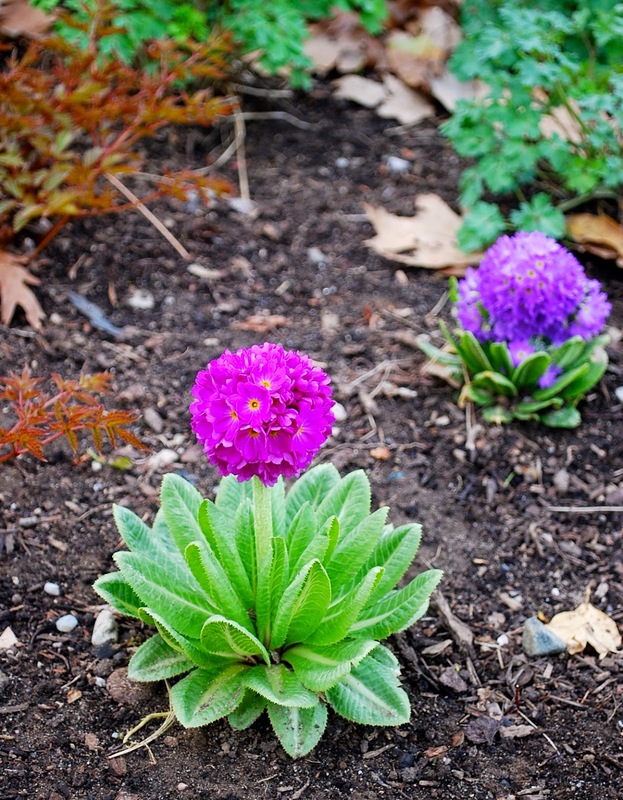 Your primula are stars and planted from seed, all the better for the gardener's heart. Enjoy the season. Gardening is an undertaking that requires a lot of planning and research. Where to begin? First, plan the design and decide on the plants. Actually this spring time are so green our natural area. So it`s the best time to plantation and make a new bed. Actually good weather is very important for growing this vegetable. I am very excited to create a new garden so, your information are very important for me. Many doctors treat this illness with a regiment of antibiotics. this can be the economical thanks to cure this illness. though antibiotics will upset you are abdomen, poignant craving severely. which may lead to weight loss because the illness progress. if you want to know more then please visit our Cannabis Stores in Edgewater website.